is on facebook..........in koru club......afta just seeing 2 amazing race teams in queenstown airport. This person is in Christchurch, New Zealand. will be on the next Amazing Race. It was filmed at my work yesturday. I will also be the guy handing the teams 'the clues' for their next challenge. haha. Great time! 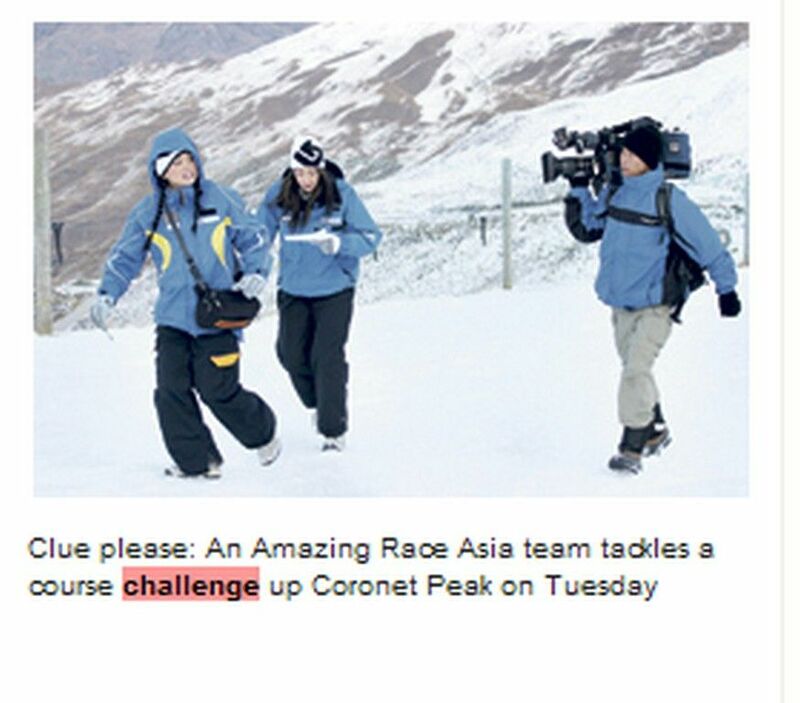 Amazing Race goes to Coronet Peak, NZ. Excellent!!! Look out SYDNEY!!! here they come!! Good job! Invercargill and Christchurch! How exciting, my home country! At least two reports of teams ongoing to Sydney. i saw an indonesian couple come in at about 2pm. they were coming into queenstown and were off to sydney. I think they flew direct at 4.20pm. then about 20mins later these 2 arab looking gurls came in. i think these two teams were in last and 2nd to last. As the one of the air line people said they had been coming in all dae. I knew it was the amazing race, because i watch the show. and i was in arrowtown earlier that day and a resturant owner told me that the amazing race was being filmed here, but i didnt c anyting, and then wen i got to the airport later on, i saw them. i got all their names even the crew! lol! Wow! Filipino pitstop greeter here in RFF!? it is the Amazing race. Is it coming to Aust? Literally running between the cars. Couldn't stop laughing. They are got into Wicked vans and opened their yellow envelopes. Look out Brisbane commuters. 97.3FM Nightshow with Hinksy Thanks to the tip of from Shaun at Taringa, the Amazing Race was in Brisbane tonight, We'll have all the info at 11! _______While at the airport in Queenstown, New Zealand today they were following the AMAZING RACE FILMING. GUESS it will be on next season, look for me, (names removed)They were trying to get a flight to Syndey, Australia. 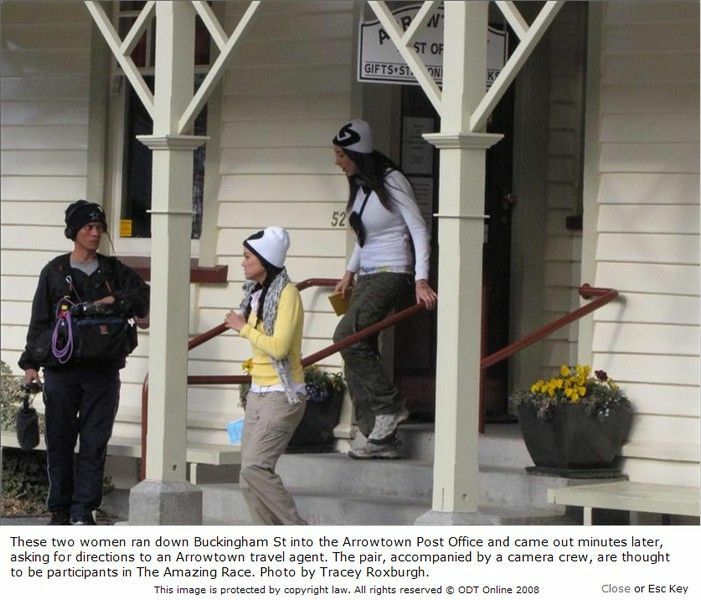 The Amazing Race moved through Arrowtown yesterday morning before heading to Queenstown Airport yesterday afternoon. While no-one will confirm it is the popular television show, the Otago Daily Times understands Destination Queenstown and Lakes Property Management had been involved in the seeking of permission for filming, including inside the historic post office in Arrowtown and along Buckingham St between 9am and noon yesterday. It is also understood participants had to try to kick a rugby ball through goal posts at the Queenstown Events Centre on Monday, before heading to Coronet Peak. Yesterday, the ODT saw two teams of two people entering the post office, camera crews in tow, and leaving moments later. One of the teams, comprising two women, asked for directions to a travel agent. One woman mentioned going to Australia. About 1.40pm yesterday, another team with two cameramen was spotted in central Queenstown. Lakes Property Services managing director Joanne Conroy said the company granted permits for filming around the district, and only one permit was active at the moment. She said that request for filming had come from Destination Queenstown and was understood to be part of its international media programme. Could they be the F/F Philippine team? Or are they the F/F Indonesians? Both look Eurasian. Here's a new picture of the teams on Coronet Peak. According to a Mountain Scene source, the show was down to eight teams when it hit the Wakatipu – they arrived in six-berth campervans on Sunday for a wood-sawing competition in Kingston. On Monday their first challenge was finding snow transceivers buried at Coronet Peak Ski Area. Teams then tore to Gibbston, where they had a choice between AJ Hackett’s extreme Nevis Highwire bungy or Arc swing. Their challenge last Monday was to kick a goal between rugby posts at the Events Centre. On hand were two All Blacks, Ben Smith and Jamie Mackintosh, and a local schoolboy rugby team. The teams, who stayed at Crowne Plaza, started Tuesday by returning to Coronet Peak for a slalom challenge on the Kaser Ski Carpet. Mountain Scene understands only one of the teams had been on skis before. From Coronet Peak the teams swung through Arrowtown, where they wrote a letter and posted it at the historic post office. For their last local challenge they went back to Gibbston, where they had a choice of herding sheep or rolling a wine barrel at Brennan Wines. The teams flew out to Sydney on Tuesday afternoon. Is Sri Lanka a confirmed destination? Nice find!! Especially as the "content is no longer available"
So will stick this here so it doesn't get lost! Same ladies as were in Arrowtown, looks like!